Is it raining men? Nope, but it is raining inside! Sarah Gustafson, a REALTOR® of 10 years in Holden, MA, opened the door to a beautiful home she was showing to clients just to find it was...raining? Not only that, but the listing agent called shortly thereafter to find out if her clients were still interested in the house! Um, no thank you! 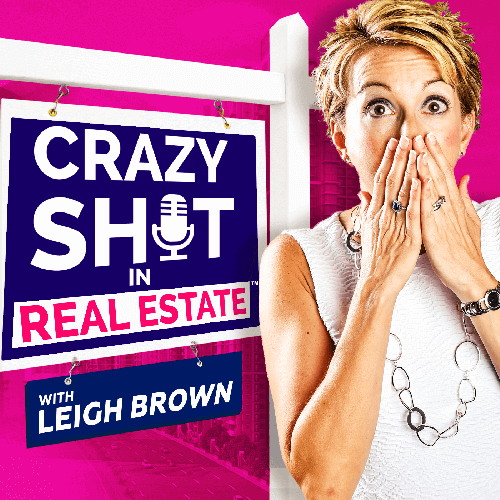 Listen in to find out why you must know where your water main is, and how she protected her clients from buying a potentially hazardous home. Can you feel the love? Brady could after Megan gave him her business card! After Megan showed him some homes, he found the one – house I mean – but not before a relationship blossomed between the two. Here’s a riddle: When would a buyer question the valuation of a seller’s house due to damage they did to it themselves? …When it’s a daughter buying from her parents! This is real estate church, and we’re preaching some truth! Early on in her real estate career, Kim Knapp learned what it takes to be successful. It’s very simple: Just be above average. Kynse Leigh is a trooper. In 2014, she opened her own brokerage –just to find out two years later that she had a failing kidney and would need a transplant. Stephanie White has worn many hats in the real estate world. She’s gone from realtor, to broker, to managing and regional broker, to working in the association world. Nope, this episode of CSIRE isn’t a Saturday Night Live skit, this is the real-life story of Shelly’s second sale! Whitney Nicely likes to move fast. From 6 week long house flips to educated decisions when it comes to renovating, Whitney knows what’s what in the world of real estate. Is this stripper pole structural? Susie Nelson-Crowley, realtor and CRS in the Tampa Bay area, will tell you that a pole, stage, DJ booth, and party tubs don’t necessarily mean an impossible sale. NAR President Bill Brown has been through the ringer for the last few months, but it hasn’t put a damper on this year’s Thanksgiving (except that he couldn’t wash down his turkey with a beer! ).